Ollie Lasalle Hinshaw3 [Ollie LeCelle Hinshaw3, Oliver L. Hinshaw2]. Born Apr 24 18691,4,10,11,12 [about 18752], Indiana1,4,10,11,12. Hinshaw, Ollie L., head-of-household, age 31, born Apr 1879 [sic] in Indiana [sic]; parents born in Indiana; married 2 years; occupation: farmer; owned farm. Hinshaw, Bertha B., wife, age 18, born Aug 1881 in Kansas; father born in Virginia; mother born in Illinois; married 2 years; 1 child, 1 living. 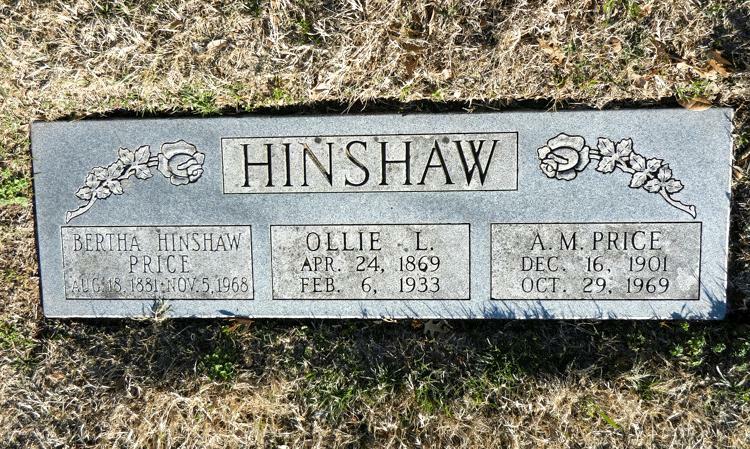 Hinshaw, Olive M. [unclear], daughter, age 1, born Nov 1899 in Oklahoma; father born in Indiana; mother born in Kansas. Hinshaw Ollie L (Bertha), mason, r 232 N Handley av. Hinshaw, Ollie L., head-of-household, age 40, born Indiana; parents born in Indiana; first marriage, married 12 years; mason, cement; owned home (free). Hinshaw, Bertha B., wife, age 28, born in Kansas; father born in Virginia; mother born in Illinois; first marriage, married 12 years; 4 children, 4 living. Hinshaw, Olive M., daughter, age 11, born in Oklahoma; father born in Indiana; mother born in Kansas; attended school. Hinshaw, Donald L., son, age 9, born in Oklahoma; father born in Indiana; mother born in Kansas; attended school. Hinshaw, Eunice O., daughter, age 6, born in Oklahoma; father born in Indiana; mother born in Kansas; attended school. Hinshaw, Forrest J., daughter [sic], age 4, born in Kansas; father born in Indiana; mother born in Kansas. Henshaw, Ollie L., head-of-household, age 50 [unclear], born in Indiana; parents born in Indiana; rented home; occupation: auctioneer, public sales. Henshaw, Bertha B. [initial unclear], wife, age 36, born in Kansas; parents born in Wisconsin. Henshaw, Unice O., daughter, age 16, born in Oklahoma; father born in Indiana; mother born in Kansas; attended school. Henshaw, Forest J., son, age 13, born in Kansas; father born in Indiana; mother born in Kansas; attended school. Henshaw, Lowell M., son, age 10, born in Kansas; father born in Indiana; mother born in Kansas; attended school. Hinshaw Donald L (Pearl) b 1024 Hendryx av. Hinshaw Madge student b 1024 Hendryx av. Hinshaw Ollie L (Bertha) stonemason r 1024 Hendryx av. Hinshaw, Oliver L., head-of-household, age 55, born in Indiana; parents born in Indiana; first married at age 24; rented home ($40 rent); no radio in home; occupation: brick mason, business [..unclear..]. Hinshaw, Bertha B., wife, age 48, born in Kansas; father born in Virginia; mother born in Illinois; first married at age 16. Hinshaw, Nita L., daughter, age 16, born in Oklahoma; father born in Indiana; mother born in Kansas; attended school. Hinshaw, Richard, son, age 14, born in Oklahoma; father born in Indiana; mother born in Kansas; attended school. Bane, Edward F., boarder, age 22, born in Oklahoma; father born in Indiana; mother born in Kansas; single; occupation: driver, truck; not a veteran. Turner, Madge, daughter, age 32, born in Oklahoma; father born in Indiana; mother born in Kansas; divorced; occupation: nurse, under graduate. 1900 census, Saline Township, Woods County, Oklahoma Territory; ED 234, page 39B, line #92, dwelling #191, family #196. 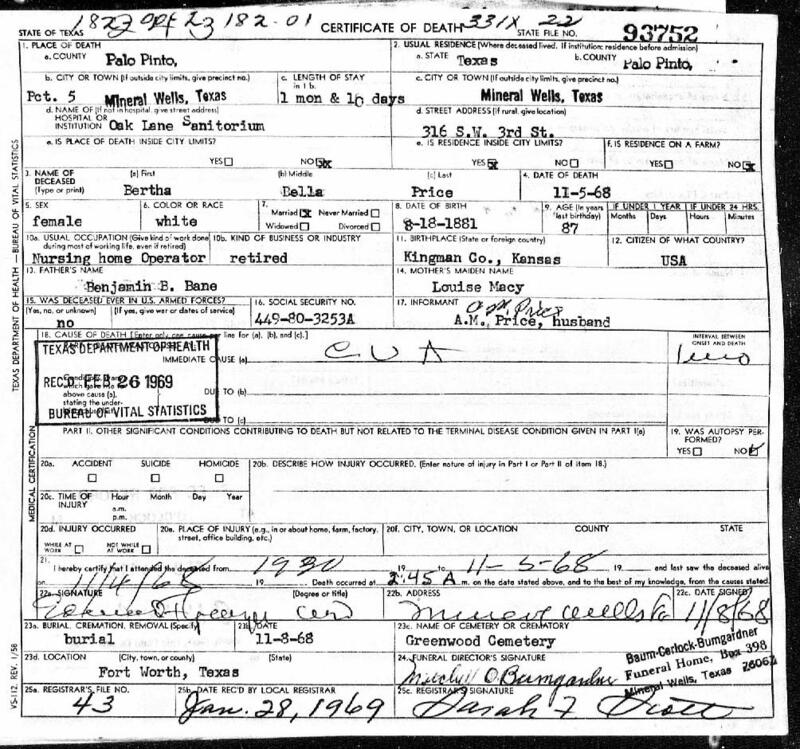 1930 census, 7th Ward, Fort Worth, Tarrant County, Texas; roll T626-2393, ED 24, page 7A, line #7, dwelling #57, family #103. 1930 census, 2nd Ward, Wichita, Sedgwick County, Kansas; roll T626-720, ED 47, page 41A, line #35, dwelling #954, family #1081. 1920 census, Laverne, Laverne Township, Harper County, Oklahoma; roll T625-1459, ED 113, page 9B, line #56, dwelling #169, family #173. Richard Shirley Hinshaw death certificate. RootsWeb WorldConnect data by Shirley Ackley ().